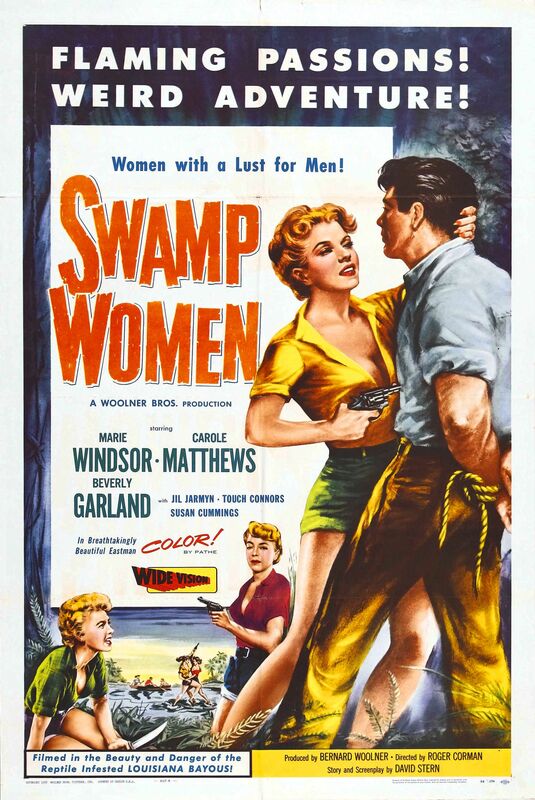 An undercover policewoman (Carole Mathews) joins a gang of female cons — Vera (Beverly Garland), Josie (Marie Windsor), and Billie (Jil Jarmyn) — as they search the Louisiana bayou for stolen diamonds. Roger Corman’s first directorial effort features many of his worst signature elements: interminable stock footage filler, brawling females, and an illogical, meandering script. Even at 67 minutes, it goes on for far too long, and fails to hold interest. One of its few mildly redeeming qualities is statuesque Marie Windsor, who is always fun to watch. On the other hand, as noted by Scott Ashlin (see the “1000 Misspent Hours Review” link below), it’s likely that Swamp Women was “a big hit with San Francisco’s lesbian underground at the time of its release”, due to the fact that “the women of the title divide neatly into a femme pair… and a butch pair” — with the ostensible male lead (Touch Connors) eventually fading into the background. No, though film fanatics may be curious to see Corman’s first directorial effort. First viewing. Not a must, even tho it’s Corman’s first time at bat. Sapphic appeal notwithstanding, boy…this one really does feel long. The good news – if there is any – is that the cast (esp. Garland and Windsor, natch) does seem to believe they’re in a real movie and they give as much of their all as they can (except for the first actress to die – a real relief since her bubble-headedness is beyond annoying). I suppose if a bad-movie-loving gang is gathered together, they could do their own MST3K thing with it – but it’s not enough of that kind of fun, really.